The term “Milled Peat” is used to describe peat in crumb or powder form. It has a mean particle size of about 1/4′ in diameter ranging from about 1/2” to fine dust. When air dried to a moisture content of 55% by weight it has a loose bulk density of between 9 and 25 lbs. per cu. ft. depending upon the degree of decomposition. Milled peat has an anhydrous calorific value of about 9,500 B.T.U.’s per lb. In contrast to sod peat, milled peat is produced over the entire working area by slicing off a thickness of about half an inch at a time. The moisture content of the half-inch layer at this stage is about 80%. Subsequently, the crop is air dried and stockpiled at 45% to 50% moisture content. In an average season twelve such crops are harvested representing a yield of 73 tons per worked acre. The gross area under milled peat production is 60,000 acres giving a working area of 45,000 acres for a planned production of 3,200,000 tons per annum. Milled peat is used for the generation of electricity in the power stations operated by the Electricity Supply Board at Ferbane, Rhode and Shannonbridge, Co. Offaly, at Lanesboro’, Co. Longford and at Bellacorick, Co. Mayo. At present the five stations have a total capacity of 290 megawatts which will be increased to 330 megawatts when the proposed second 40 megawatt set at Shannonbridge is constructed. With the completion of Shannonbridge station the annual consumption of milled peat by the E.S.B. will be 2,400,000 tons. In addition to its use for the generation of electricity milled peat forms the raw material for the production of peat briquettes in the Bord na Móna briquette factory at Derrinlough and Croghan, Co. Offaly and at Lullymore, Co. Kildare. These factories use annually about 800,000 tons of milled peat. Milled peat in Ireland was first produced on a commercial scale for the manufacture of briquettes in 1934 at Lullymore Bog, Carbury, Co. Kildare by the Peat Fuel Co. Ltd., which was a private limited company. 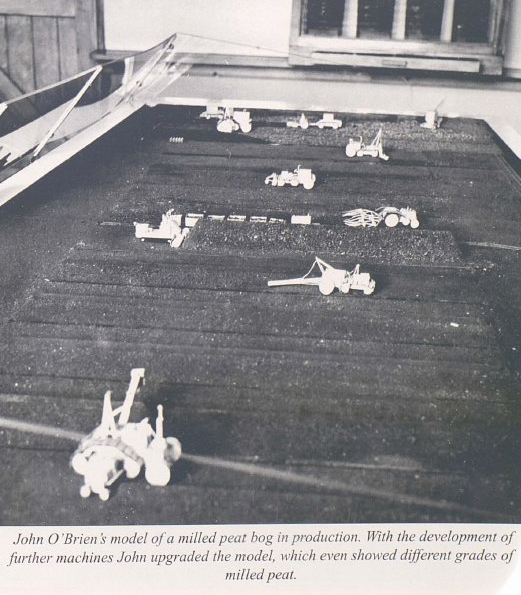 The successful production of milled peat at Lullymore in the years following its purchase by Bord na Móna aroused interest in the possibility of using milled peat for the generation of electricity on a large scale. Experience at Lullymore indicated that calorie for calorie milled peat could be produced at a lower cost than sod peat mainly because the production process lent itself more readily to full mechanisation. In 1952 after study of the economics of milled peat production and the technical problems of burning it in electricity generating stations, it was decided in joint consultation between the Electricity Supply Board and Bord na Móna that any new peat works assigned to the supply of fuel for electricity generation should be developed for milled peat production. Production of milled peat in Ireland is on the Peco system named after an early development company which operated at Dumfries in Scotland. Parallel open drains are cut at 50 ft. centres over the entire working area dividing the area into fields 45 ft. wide. Typically the field drains are from 800 to 2,000 yards long discharging at either end into piped outfalls which run at 90° to the open drains and which themselves discharge into the nearest natural outfall. Beyond the piped outfall is left a headland or turning ground 70 to 100 ft. wide and running parallel to the piped outfall to enable production machines to turn from one field into another. When fully developed the open field drains have a depth of 4′ 6” and a top width of about 5′ 0”. The field drains are excavated and maintained by machines called disc ditchers. The disc ditcher consists of a cutting disc rotating at a speed of 124 r.p.m. carried on an arm offset from a tractor unit. The tractor is powered by a 6 cylinder 90 h.p. diesel engine and runs on timber swamp shoes and front rollers. The complete machine weighs 17 tons but has a bearing pressure of only 1.63 lbs. /sq. in. The working forward speed can be varied from 70 to 650 yards per hour as required by working con­ditions. A permanent 3 ft. gauge railway runs outside the turning ground joining the various bog areas and leading to the power station or briquette factory with spur lines to works centres, workshops and fuel depots. For production purposes the bog area is divided into units of eleven fields comprising a central stockpile field with five production fields on each side. The produce of the ten production fields is stored on the stockpile field which can accommodate from 10 to 20 harvests of milled peat depending upon peat density. When it is decided to sell a stockpile a temporary railway track is laid alongside from the permanent railway line. On completion of loading the temporary track is lifted and re-laid along another stockpile and so on. Undrained bog because of its instability requires 4 to 5 years progressive drainage to get fields down to a stable depth of 4′ 6”. At this stage the moisture content of the upper 2 ft. is down to 90 %. In the final years of development the surface is cambered by levelling machines and bulldozers and after a final deepening of field drains the bog is ready for initial production. For the first 2 or 3 production years, yields are low due to the high moisture content of the surface, the low density peat which is usually at the surface and the surface deformation which occurs in the early years. Even if weather conditions are favourable production must be restricted in the first few years to avoid permanent damage to the bog surface and drain edges. In general it requires six to eight years of careful development and initial production to bring a bog from the undrained state to a stage at which standard yields can be expected. Throughout the production life of a bog field profiles and field drains must be maintained by cambering, levelling and disc ditching. In general field drains in production areas are ditched twice a year while levelling and cambering by bulldozer and screw leveller are carried out as required and vary considerably depending upon the production age, peat quality and depth of the bog area concerned. The milled peat production season can commence any time after mid-April if weather and bog conditions are suitable and when sufficient evaporation has taken place to enable machines to travel on the bog surface. This is the cutting or milling operation which is carried out by an attachment mounted behind a half-track tractor powered by a six cylinder, 135 h.p. diesel engine. The attachment consists of three milling drums covering a total cutting width of 22′ 9” so that two runs of the miller span the entire field width. The milling drums carry a series of steel pins 1 1/4” long which mill the bog surface to a depth of about 1/2” leaving behind a layer of milled peat. The milling drums driven by the tractor P.T.O. shaft revolve at a speed of 350 rev. per minute and the forward speed of the machine is about 5 miles per hour. The attachment is supported by ground rollers and hydraulically operated depth control castors. For idle travel the attachment is lifted clear of the bog surface by a hydraulic ram. The milled layer is allowed to remain undisturbed until its surface is dry which requires about 4 mm. of evaporation as measured in the standard American type pan evaporimeter. This represents the amount of drying which takes place between about 8 a.m. and 3 p.m. on a typical drying day in summer. The milled layer is then turned over and corrugated by a spoon harrow. The harrow is drawn by a 35 h.p. agricultural tractor fitted with half-tracks and consists of 88 spoons mounted at 6” centres on a tubular steel frame. The spoon blades are of steel plate and are fitted with base plates to prevent them scraping wet particles from the bog surface below the milled layer. The speed of harrowing should not exceed 3 1/2 miles per hour for maximum drying efficiency. At first harrowing, the moisture content of the crop is typically 68% to 72%. Thereafter harrowing is repeated at evaporation intervals of about 4 mm. until the moisture content is down to 50% after which the crop is allowed to remain for a further 4-5 mm. of evaporation reducing the moisture content to about 45 % before ridging. The number of harrowings required per crop can vary from 2 to about 5 depending upon drying conditions, water table level in the fields, initial moisture content at milling and peat quality. If rain intervenes, of course, many more harrowings may be required. When the moisture content of the crop is down to about 45% the peat is angle dozed into a triangular shaped pile or ridge in the centre of each production field. This operation is called ridging. A typical ridge realises about 23 tons per kilometre of length at the standard moisture content of 55%. The ridger has 2 blades mounted behind a half track tractor powered by a 135 h.p. Gardner diesel engine. The blades form a V-shape in plan behind the tractor and are set at an angle of 30° to the direction of travel. Together they span the production field with a gap between them of 1 metre to accommodate the ridge. The blades are of aluminium with stainless steel soleplates and are made up in hinged sections to enable them to follow the contour of the bog surface. The ridger has a working speed of about 5 miles per hour. When ridges have been formed on all ten production fields they are transported into the central stockpile field by a harvester. The harvester unit is mounted on a fully tracked tractor powered by a 90 h.p. Gardner diesel engine. This machine picks up the ridge by means of a spiral unit positioned on one side of the tractor. The spiral delivers the peat onto a belt which conveys it to the centre of the next field. In this way the ridges are transferred field by field towards the central stockpile each ridge or ridges being deposited on top of the next adjoining ridge until finally a large ridge containing the peat from all five production fields on one side is delivered into the stockpile. Harvesting completes the production cycle and the miller, following the harvester, commences the next cycle. Each cycle is known as a harvest and yields just over 6 tons per nett acre. In fine weather conditions it takes about 3 days and about 15 to 18 mm. of evaporation to obtain a harvest. Evaporation of about 5 1/2mm. per 24 hours is typical in anti­cyclonic conditions during the summer months. While stockpiles are being built up during the production season the peat in them is compacted by drawing articulated rollers along them. Compaction is commenced after the third or fourth harvest and in general is carried out every second harvest thereafter, with a final compaction run when the stockpile is completed. The rollers are hitched by steel cable behind two agricultural tractors which travel one each side of the stockpile, hauling the rollers along the stockpile. The rolling unit is composed of eleven watertight steel rollers each 2′ 6” in diameter x 4 ft. long and mounted on a frame in two parallel lines. The assembly is articulated so that the rolling unit can follow the profile of the stockpile. The rollers may be ballasted with water as required. The function of compaction is to afford protection against wind damage during the production season and to reduce the bulk of the stockpile for covering with polythene film. A typical completed stockpile is roughly triangular in section but with rounded top due to the compaction rollers. It contains about 14 harvests, has a base width of about 25 ft., a height of about 10 ft. and weighs about 3 tons per yard run. The milled peat production season tails off rapidly after mid-August from which date covering of stockpiles with polythene film commences. The film used is of 250 gauge clear polythene delivered in unjointed rolls approximately 100 yds. long. Roll widths range from 24 ft. in steps of 4 ft. to 40 ft. in order to accommodate all sizes of stock­pile. Covering commences in mid-August and is usually completed before the end of September. The film is held down by ballasting with wet milled peat deposited on the polythene along each side of the stockpile by the milled peat harvester. The layer of wet peat is from 12” to 15” deep and extends about 6 ft. up the sloping side of the stockpile. The polythene film must be generously lapped at the joints between successive rolls and the joints are secured with large freshly-cut sods of peat built up from ground level on each side and extending right across the top of the stockpile. In general about two-thirds of milled peat stocks are protected by polythene, peat scheduled for sale in the first three months following the end of the production season being left uncovered. The purpose of polythene is to keep stocks dry, to protect them against wind erosion and to inhibit self-heating and self-ignition in certain types of peat by the exclusion of air. All bog areas are served by a 3 ft. gauge permanent railway system from which temporary spur lines are laid alongside the stockpiles as required for loading. The loader consists of a tractor with a 25 ft. wide ground spiral mounted in front, feeding a bucket elevator which discharges onto a belt conveyor carried along a jib and delivering the peat into 16 cu. metre wagons. The machine is powered by a 60 h.p. 4 cylinder Gardner engine and its working speed can be varied from 2.2 to 109 yards per hour depending on stockpile size. Typical forward speed when loading is about 30 yards per hour giving a loading rate of up to 90 tons per hour. The normal train or rake consists of fifteen 16 cu. metre wagons hauled by a 80 h.p. locomotive with 6 cylinder diesel engine. Weight of peat per rake varies from 50 to 120 tons depending upon peat quality. The locomotive weighs 9 tons while the empty wagons weigh 2 1/2 tons each, giving a total dead weight of 47 tons per rake. Wagons are joined by rotary couplings and each can turn through a vertical angle of 360 deg so that tippling is carried out at power station or briquette factory without uncoupling wagons, each wagon being emptied individually in a rotary tippler while still coupled to the remainder of the rake. Transport of milled peat takes place night and day and on every day of the year. An 80 megawatt power station can consume up to 4,000 tons of peat per 24 hours while the larger briquette factories use about 1,000 tons in the same period. A continuous process of development is taking place in production techniques and production machines with the objects of increasing yields per acre, stabilising production yields as between favourable and unfavourable summers and ultimately, of course, reducing production costs. Production machines have been modified and new designs introduced to increase their capacity. A system of underground drainage has been developed recently which promises to increase yields in areas of poor quality peat, while experiments at present going on using a pneumatic machine for gathering peat will, if successful help to counteract the effects of unfavourable weather on production yields.